ABS Enclosures For Electrical Housing Applications. – Self-extinguishing ABS and polycarbonate (larger enclosures with glass reinforcement). – Grey or clear colour. – Temperature Range: -40 to +80 degrees Celsius. 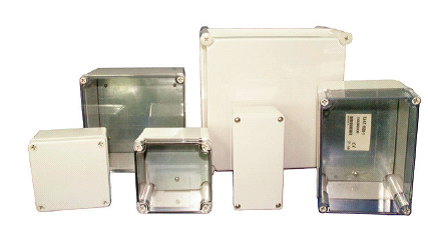 – Enclosures supplied complete with mounting plate. 16TJAG0811 80W x 110H x 70D mm, mounting plate 68 x 92mm, grey. 16TJAT0811 80W x 110H x 70D mm, mounting plate 68 x 92mm, clear. 16TJAG0816 80W x 160H x 70D mm, mounting plate 67 x 147mm, grey. 16TJAT0816 80W x 160H x 70D mm, mounting plate 67 x 147mm, clear. 16TJAG1212 125W x 125H x 100D mm, mounting plate 112 x 112mm, grey. 16TJAT1212 125W x 125H x 100D mm, mounting plate 112 x 112mm, clear. 16TJAG1520 150W x 200H x 100D mm, mounting plate 135 x 189mm, grey. 16TJAT1520 150W x 200H x 100D mm, mounting plate 135 x 189mm, clear. 16TJAG15201 150W x 200H x 130D mm, mounting plate 135 x 189mm, grey. 16TJAT15201 150W x 200H x 130D mm, mounting plate 135 x 189mm, clear. 16TJAG2020 200W x 200H x 130D mm, mounting plate 180 x 180mm, grey. 16TJAT2020 200W x 200H x 130D mm, mounting plate 180 x 180mm, clear. 16TJAG2819 280W x 190H x 130D mm, mounting plate 260 x 160mm, grey. 16TJAT2819 280W x 190H x 130D mm, mounting plate 260 x 160mm, clear. 16TJAG28191 280W x 190H x 180D mm, mounting plate 260 x 160mm, grey. 16TJAT28191 280W x 190H x 180D mm, mounting plate 260 x 160mm, clear. 16TJAG2828 280W x 280H x 130D mm, mounting plate 245 x 245mm, grey. 16TJAT2828 280W x 280H x 130D mm, mounting plate 245 x 245mm, clear. 16TJAG28281 280W x 280H x 180D mm, mounting plate 245 x 245mm, grey. 16TJAT28281 280W x 280H x 180D mm, mounting plate 245 x 245mm, clear. 16TJAG34281 340W x 280H x 180D mm, mounting plate 300 x 245mm, grey. 16TJAT34281 340W x 280H x 180D mm, mounting plate 300 x 245mm, clear. 16TJAG38281 380W x 280H x 180D mm, mounting plate 345 x 245mm, grey. 16TJAT38281 380W x 280H x 180D mm, mounting plate 345 x 245mm, clear.